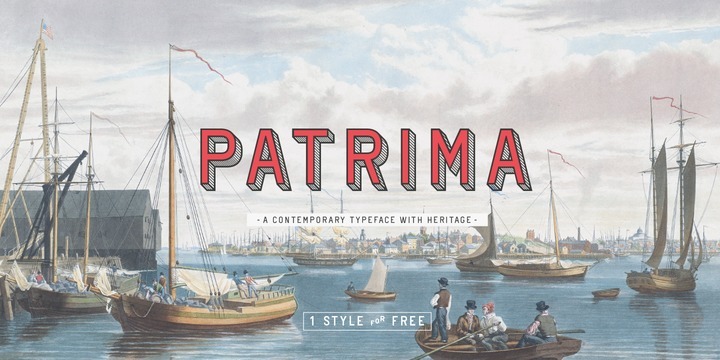 Patrima is a contemporary typeface with heritage created and published by Juri Zaech which is available in 5 styles and useful OpenType features. Inspired by the decorative type applications of the end of the 19th century it has a retro look. It merge well on large sizes. This versatile font is perfect for editorial purpose, display applications, logo, poster, typographic use etc. Have fun! Price: starting from $30,00 for one font to $65,00 for all 5 fonts. A font description published on Monday, March 26th, 2018 in Fonts, Juri Zaech, Juri Zaech by Alexandra that has 2,220 views.